Greg Lail LLC Electrical Contractors, a residential, commercial and industrial electrical contracting company located in Youngsville Louisiana serving the Louisiana and Texas Gulf coast. When you are looking for an electrician in Louisiana or Texas, look no further than the electrical experts at Greg Lail LLC of Youngsville, Louisiana. Our whole company is dedicated to meeting and exceeding your expectations. Our friendly and knowledgeable customer service staff is ready to take your call and help you with your electrical needs. Whether you need a service electrician, a maintenance electrician, an industrial electrician, or a residential electrician, Greg Lail’s staff of experts can solve your electrical problems. 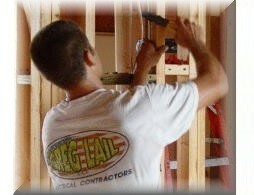 We have provided you with several views of Greg Lail LLC Elecrical Contractors. Look through our website, learn about our company, our services both in business and as part of the community. We welcome any and all inquiries and make it a priority to provide you with a quick response.